Weiner Dogs Woody and Chloe will be traveling by waterways from far Eastern Kentucky to a fishing tournament at Kentucky Lake. You can imagine the misadventures of Woody as they find rivers and creeks and lakes and ponds across the state. The Adair County Community Voice joins Kentucky Press Association and other Kentucky newspapers in sponsoring the book, written by Leigh Anne Florence with artwork by Chris Ware. One chapter will be published in the Community Voice for 10 weeks. We also have available a limited number of paper scrapbooks so children can cut out each chapter and make their own scrapbook. Scrapbooks are available for no charge, just drop by the Community Voice office at 316 Public Square during business hours. 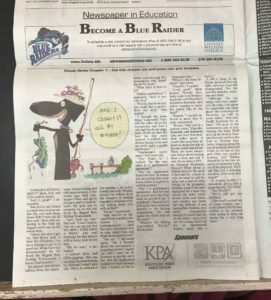 This chapter series is provided exclusively through Kentucky’s newspapers and Lindsey Wilson College has graciously agreed to sponsor the chapters through our Newspaper in Education program, which provides free newspapers to schools for students to use in the classroom at the teacher’s request. If you have children who are home schooling or just want to make sure your child gets to enjoy the adventures of Woody and Chloe, make sure you grab the next 10 weeks of the Voice and drop by our office to pick up a free scrapbook!